Jesus heard that they [the Pharisees] had driven him out, and when he found him, he said, “Do you believe in the Son of Man?” He answered, “And who is he, sir? Tell me, so that I may believe in him.” Jesus said to him, “You have seen him, and the one speaking with you is he.” He said, “Lord, I believe.” John 9:1-7; 35-38. I regularly travel with some friends to a camp in the Sangre de Christo mountains of New Mexico. There, away from the lights of the city, when the sun sets in the forest, I’m always struck by just how dark it can get. That kind of darkness impresses us with fear, with vulnerability and with isolation. I suspect that’s exactly the sort of life the man born blind led until his encounter with Jesus. In the Daily Office today, we find the story of Jesus and that man, set out in the ninth chapter of John’s Gospel. It’s a powerful story, powerful enough to have inspired the former slave-trader John Newton to pen one of our favorite hymns, Amazing Grace. (“I was blind, but now I see.”) This story also illustrates two of the attributes of Jesus’ name described by Bernard of Clairvaux in my last post: Jesus is light and Jesus is healing. Back then, the Jewish people associated blindness and most any sort of physical infirmity with sin. The disciples echo this assumption, asking whether this blindness resulted from this man’s sin or the sins of his parents. That assumption, expressly rejected by Jesus, lingers on with us today. From illness to natural disaster, people and their “religious” leaders try to assign the fault for these events to some past moral failure. Jesus refuses to take part in that speculation. Jesus spits on the ground and makes mud which he spreads on the man’s eyes. It’s an interesting and curious approach to this man’s predicament, but I think part of the key to understanding this story lies just a couple of sentences earlier. Rather than explaining to the disciples the real cause of this man’s blindness, Jesus tells them: “We must work the works of him who sent me….” Having been sent by God, Jesus must engage in God’s work. 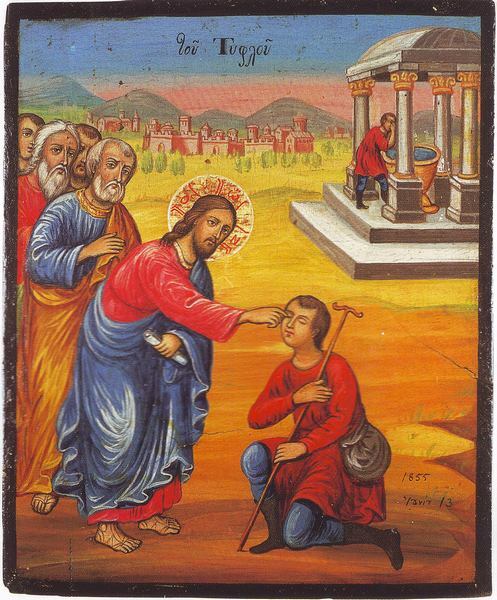 Jesus didn’t need a poultice to cure this man’s blindness, but I think he intentionally invoked the image of God’s creation of Adam. Just as God created Adam from the clay (mud) of the earth, Jesus will re-create this blind man’s life. Jesus then instructs the man to wash himself in the pool of Siloam. (Notice that this is the work for which God “sent” Jesus into the world, and the very name of the pool means “sent”.) The Jewish people used that pool as a place for ritual purification, necessary for entry into the Temple. The man born blind is thus “baptized” back into the community of those eligible to encounter God in that Holy Place and his sight returns. The pool, intended as a place for purification, has become a place for healing and reconciliation. Now, all this transpires on the Sabbath, and provides the Pharisees with one more instance of Jesus’ disregard for the religious traditions (and authorities) of the day. The Pharisees convince themselves that Jesus is a great sinner, just like the man born blind, whom they expel. John thus makes clear that they remain in the darkness, spiritually blind. I’m wondering, who is unwelcome today and who have we excluded because their “sin” disqualifies them? Like the Pharisees, have we fallen in love with doing “churchy things” rather than falling in love with God and his children? Are we instruments of reconciliation in the world, or do we place obstacles in the path of those who want and need God’s help? And perhaps more importantly, I wonder where are the dark places in the world and in our lives not yet illuminated by the light of Christ? This entry was posted in Uncategorized and tagged Anglican, Bible, Disciple, Bible, Blindness, Christianity, Jesus, Miracles, Pastoral Care, Pharisees, Pool of Siloam, Spirituality. Bookmark the permalink. So, so true!! Many of us “think” we are inclusive, but are we really? Thanks for the post. I think one could also read this story as a personal allegory: examining what parts of our own lives are we not willing to let Christ into because they’re just too unholy. That sort of spiritual apartheid creates a great danger for most of us. I agree! You have made me think and pray about what areas I have compartmentalized. That last paragraph struck a nerve. How I wish I could say yes to all of the questions, but the best I can do is say sometimes. Asking where the dark places in my world and in my life…plenty to chew on there. I most appreciate the life-examples you offer in making your point, Br. James. They take the teaching from “the classroom into the world” in which I live and make it much more accessible to me. Thank you again for the gift of your words. thanks for this. I am particularly struck by your questions to us – I will think today about my “dark places” and how I might participate in opening them to the light. Thank you James for these powerful words as they tugged at not only my heart but my soul. Perfect way to begin a new year is by exposing those dark areas to the light! Abrazos! You know you’re always welcome. Abrazos a ti, darlin. Thanks for challenging me this morning, Brother James. God has graciously placed many opportunities around us, so that we might be the hands of Jesus to those that our society has marginalized. I reminded of the parables of the sheep and the goats and the parable of the talents. I am relearning that He blessed us so that we might be a blessing to others. What am I doing with the talents He has given me? Those are rich observations and questions. I think these are issues we work out with fear and trembling. If only you knew how much I appreciate the sincerity and love in your commentaries- this one was very timely yesterday when I came home and read it. Please keep up this marvellous ministry you have on your blog. A lady at church, yesterday, where I spent the day creating a canvas of the Coming of Christ came and spoke to me about how, as Anglicans we are always so concerned with doing things in such a narrow and correct way- fearful of making mistakes. It leaves little room for forgiveness and understanding of those who dare to make mistakes, who live lives in a different way. Great sinners like myself should learn more compassion for those who have not had the same opportunities for suffering and remorse. Reverse snobbery, I am contemplating you with more attention from now on. Thank you for your kindness, for your support and encouragement. I think we all could use more compassion, and I know this world could. I really appreciate your gentle presentation. I was instantly engaged, mentally and in my spirit. There is much here to reflect on, but also a challenge that is not overwhelming or offish, but inviting. The image of reconciliattion and the reconciler strike me deeply. Thank you for sharing these thoughts. I’m so glad you liked the piece. The process of reconciliation seems so very critical; one could easily conclude that Jesus principally came to show us how that works. That phrase struck me well. Before I began preparing the post, I’m not sure I had paid very much attention to it. But if we accept that one of the purposes of the Incarnation was for God to show us a better way to live, to reveal his intentions for mankind, I think we have to take that notion very seriously. This is a lovely site, and I will make regular visits here. Thank you for visiting and enjoying my blog as well.